Firefighters from Lewes responded to a blaze caused by a tumble dryer at a property in Pound Lane, Laughton, shortly after 10pm yesterday (Wednesday, January 3). On arrival, crews confirmed the building was well alight. The fire affected the first floor, ground floor and roof space. The flames also affected an adjacent building. Crews used breathing apparatus, a hose reel and compressed air foam. The gas and electricity supplies were isolated. 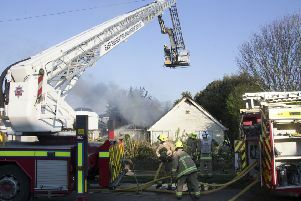 A home safety visit was carried out along with a fire investigation. Watch Manager, Lewes, Steve Deakin, said: “Our advice regarding tumble dryers is that they should not be used when you are sleeping or when you leave the premises.